I was born in 1952 in the Burov family in Poltava, Ukraine. It was the family of doctors. After high school I graduated from Poltava Cooperative College, then - Poltava Cooperative Institute, and received the specialty of an expert in the science of commodities of the highest qualification. I studied at Ternopil Republican School of decorators-advertisers on a full-time basis and received the qualification of decorator-advertiser. More than 30 years I worked in the field of trade and advertising. Since I was a child, I’ve been fond of three-dimensional works of national craftsmen and different kinds of decorative arts. When I grew up my child's passion to art turned into three-dimensional works – seeds panneau which is made fro painted fruit pits and stones of various plants grown in Poltava: plums, cherry-plums, cherries, grapes, melons and watermelons, sea-buckthorn, white-rod; grains of buckwheat and millet. 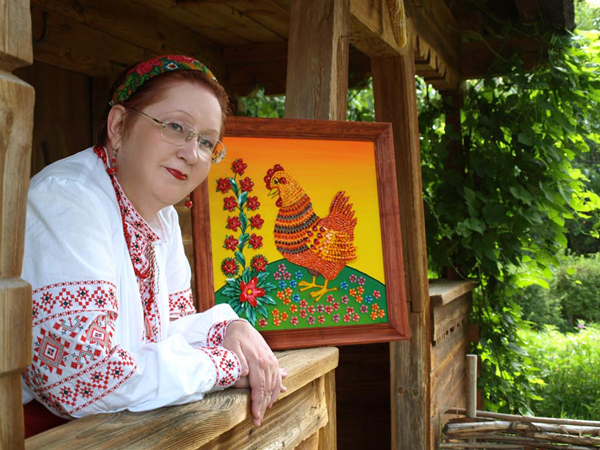 Bright coloured birds, flowers, ornaments which are depicted in the images on my panneau, accentuate the picturesque and blooming land of Poltava region. I wish my activity would fall into the full-flowing river of Decorative Arts of Poltava, which develops and brings fame to our native Ukraine. Let’s give glory to our Creator for the unique colorful nature and marvelous beauty of its flowers, birds, and the magic colors of the rainbow.